Estimated value (2014): $630,000 *Based on recent sale values of Catlin's paintings and adjusted for inflation. Notes: George Catlin wanted the U.S. government to purchase his Indian-themed paintings for preservation, but his wish was not granted. He was forced to sell his original collection to a private collector. Some of his paintings eventually made their way into various museum collections. This work is one of over 600 paintings attributed to George Catlin. The painter spent a considerable amount of time traveling and living in Indian tribal areas. During his travels, he befriended many natives and painted numerous portraits of Indian Americans and their daily lives. Catlin was also a lover of nature and an active campaigner for the preservation of Indian tribes. His rich experience was reflected in this painting. 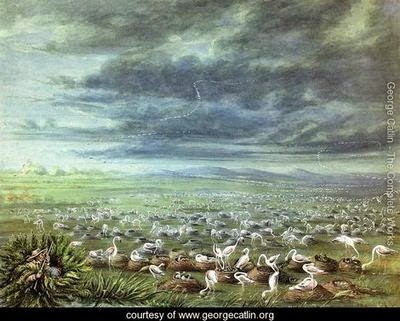 The painting depicts a beautiful field of flamingos and their nests. Lurking behind the bush is a hunter; he is waiting for an opportune time to strike. This well-constructed art piece is a grim reminder of how quickly and sudden Nature’s beauty can be destroyed by man. It is remarkable how Catlin managed to depict his subjects so vividly and lifelike. Each of the flamingos is given a unique pose; even the ones out of focus has their own characteristics. The level of details in this painting is admirable. Under his clever brush strokes, the environment and landscape really come alive. This is probably the best painting in Catlin's Indian Gallery collection.